Opinion Piece – Who will buy your landscape prints? On a recent visit to Wales, Keith spent a while discussing the business side of photography with a successful gallery owner. The discussion only reinforced many of the aspects of the business side of photography that Keith has written about for several years, on this site. So, why do people want to buy landscape prints? 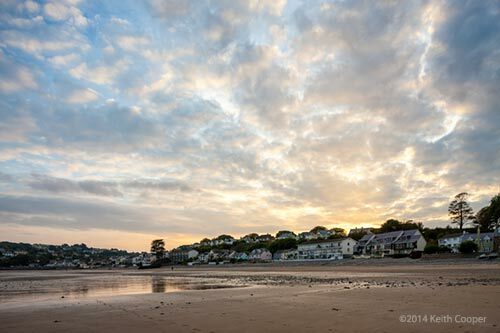 The photograph to the right is the beach at Saundersfoot in Pembrokeshire, Wales. I stayed there a few days, and this was the best looking sunset of the week. Taken with a TS-E 24mm shift lens, which gives a wide view, sharp to the corners. It also keeps the buildings vertical, avoiding the ‘leaning inwards’ look you get with wide lenses when pushing the horizon low. The lighting is pretty faithful to my recollections, and I’d note that this is not an HDR image – just a single well exposed RAW file processed in ACR/Photoshop with a bit of boost to the blues in the sky, and a bit of sharpening for viewing at this small size. It’s got a lot of detail in it and would make for quite a nice print. Indeed Karen, my wife, already wants a print for our house somewhere. Is it a picture that would have wider appeal? I doubt it. The market for a print like this is quite localised. In the town, near the harbour, there is a small photography gallery run by Dilys Hackett. I spent a while with her, talking about how she prints, colour management and other stuff, particularly what sorts of photos ‘work’ from a sales point of view. It was interesting to see that she was using an A3+ printer (an Epson 2880 – soon to be replaced by an R3000). The printer has a continuous ink system, and she is in fact the first person I’ve ever come across with such a system, where it makes genuine economic sense. I’m convinced that the majority of such systems are sold to people who never really see the benefits. One thing to remember with such systems is the need to print regularly and in sufficient quantity to make such a print set-up work for you, and keep it trouble free. By producing prints at standard sizes she makes framing easier (and more economical). A3+ or 13″x19″ seems small to me, but my large prints tend to go for corporate/display use and rarely for residential. As we agreed, most people don’t have walls in their homes large enough for the big stuff. People are impressed by the big prints, but don’t buy them. Framing is available, with frames sourced locally. 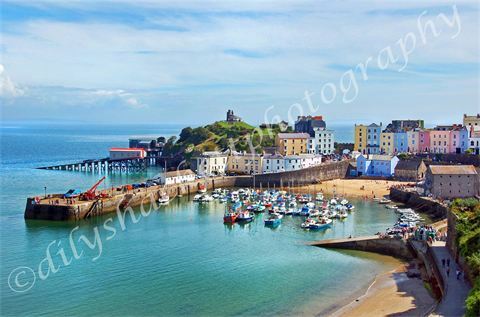 The picture to the right (by Dilys) is of the small nearby town of Tenby. It’s one of her most popular prints. Having been there, it’s a much more ‘touristy’ place than Saundersfoot, and I can see why such a print would be a popular memento of a visit. Pembrokeshire (the far southwest tip of Wales) is not large, but even there, you need to know the localities if you want prints shown, that will interest people. 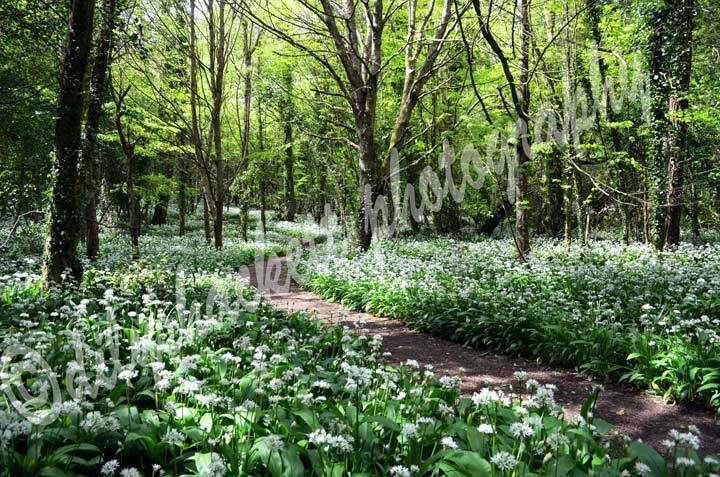 These wild garlic plants at Stackpole are local to Pembrokeshire and familiar to many visitors. 20 miles can be quite a distance in this respect. 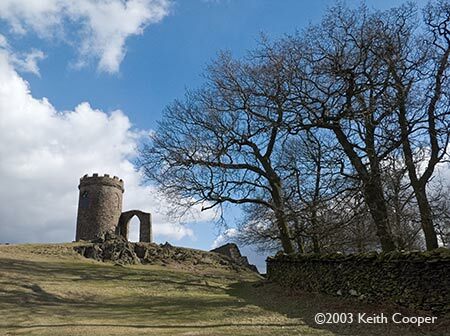 I’m reminded of my own image of a local landmark – taken whilst testing a camera in 2003. I don’t actually like it that much, but here in Leicester I’ve sold a number of copies (max. size ~A3). It’s easy to think that a shot is so obvious that no-one would want it. Well, this is often plain wrong. A well executed shot of a popular view is no less ‘worthy’ than something which really appeals to your ‘artistic’ side, and will often sell far better than your favourites. I’ve heard it said that a good photo is one people want to look at, and it’s worth remembering that you don’t have to like a photo for it to sell. All too often it’s your own sensibilities as a photographer that can get in the way of taking profitable photos. Who buys landscape prints and why? If you don’t know your target market and what makes them likely to buy your prints, then you could easily end up with a gallery but no customers. I first saw one of Dilys’ prints in the guest house we were staying at – I might have missed the gallery otherwise. In a small town, it really does help to build working relationships with other local businesses. I often hear people asking if they should show their work in local restaurants/cafes? All to frequently, this is just a way for the business to get some free art on the wall and nothing but a warm feeling for you. However, if it is local, relevant, and with a nearby gallery, it can be exceedingly useful. It’s part of an integrated approach to your marketing, and like much of running a successful photography based business, very little to do with taking photos. What about ‘craft fairs’ and the like? Note that I’m talking about the UK market here. I know that it’s different in parts of the US, but the principles are similar. Karen designs jewellery, and I noticed that both her and Dilys had a very low opinion of the worth of craft fairs as a profitable and useful way to sell your work. First up, the customers seem to have a ‘yard sale’ mentality (or ‘Car boot’ in the UK) and want everything for next to nothing. Secondly, you are surrounded by people selling stuff who have no real business acumen and regard a sale that covers just material costs as a success. Not an environment for your business to make a profit, or to leave you feeling good at the end of the day. I sell relatively few large prints, so each one is effectively a special order. Printing is not our main business, so I don’t need a room full of packing materials, or to worry too much about walking round to the Post Office to drop off a parcel. BTW If you did wonder just what it is I do to earn a living, see our brand new architectural photography web site, which is very different in design to this one. In fact it’s so new that I’d really welcome any feedback. When I was talking to Dilys, she pointed out that having mounted prints in standard sizes also reduced that final bit of sales friction, for people wanting to take prints home with them (although she does ship framed prints too). I’m not saying that if you want to sell prints, then only local works. It’s just that for most people who ask me about selling their landscape photos, this is how it works best, if you want it to be part of earning a living. Other types of prints (nature or street photography for example) are different markets, which you need to understand just as well to be in. I’ve not covered them here, since neither are areas I know enough about.